- 10 % discount until 15 Dec 2017. - 6=5 & 14=12 during 01 Dec - 27 Dec 2017; 13 Jan - 31 March 2018. Extras and Early booking discounts are NOT combinable! 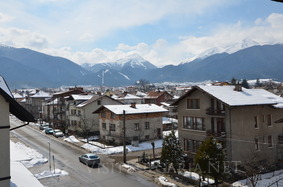 Location: Olymp hotel is located at the beginning of Bansko, in a quiet area, 2 km from the ski lifts and 5 minutes walk from the central area. Accommodation: The hotel consists of 2 buildings connected with each other, including 30 double rooms, 4 apartments and 2 maisonettes. Amenities: Telephone, TV, internet, mini bar and private bathroom with shower. SPA centre: The SPA centre offers different massages and spa procedures and therapies, contrast showers, steam bath, sauna, jacuzzi, relax zone, fitness centre, outdoor swimming pool. Facilities: 24-hour reception, reception safe, spacious lobby bar, main restaurant with fireplace, tavern, conference hall, fitness centre, spa centre, playgrounds, ski storage for own accessories, free parking, summer garden with barbecue, outdoor swimming pool. Shuttle service to the first lift station by hotel schedule. Services: Laundry, ironing, dry cleaning, transfers, car rental, bike rental, tourist services - tours, picnicking, horseback riding, various fun games, hiking in the mountains, archery, paintball and much more.